Dryads are the elementarians of the west, the element of life. 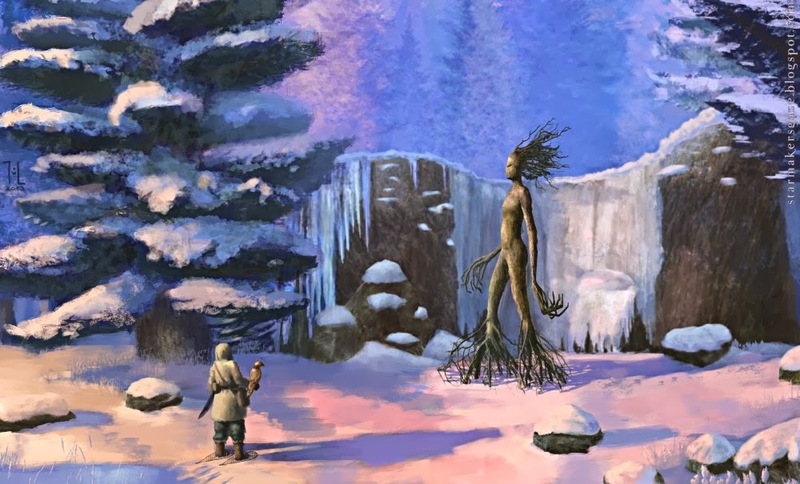 Several meters tall, with overly long arms, numerous fingers, and roots for legs below the knee; dryads are perceived as female. Their skin is bark, they have twigs for hair, their mouthless face shows bright eyes and a grim expression. A dryad fiercely defends her hometree, but can live without it. Unlike other elementarians, dryads hardly ever speak and are considered the most powerful of them. "It is not by accident that we call a devastating event or a tool of destruction "a dryad's word". The last time a dryad spoke, all of Gdera heard it. We should be thankful that the ominous treeladies rarely utter anything." While dryads are not evil, they are the least predictable elementarians and busily pursue their unfathomable plans. They appear in destroyed forests to restore them, or even destroy artificial structures themselves. A traveling dryad is reason to abandon settlements. A resident dryad, however, guarantees rich harvest, intact woods, and good health. "The sitting dryads in Clom Vah's great voice hall have legs. Since they usually don't, one cannot tell if he statues really are dryads - many mages tried to find out. Without success." Dryads are wonderful mythological creatures. I wanted to keep them close to the easily angered Greek originals. However, there's only one dryad per wood, not per tree. They're the reason words are so powerful in Genius Loci - I had drawn a mouthless dryad and wondered if they could speak at all, and what that would be like.